Srinagar: Kashmiri bureaucrat turned politician Shah Faesal has appealed people not to donate worn out socks and underwear for his crowdfunding campaign, as these were of no use. “It has become a nightmare. Now I have to even tip off the safaiwalla to take away hordes of worn out socks and underwear. Yorei chu kharuch gascaan (I have to spend on it),” Faesal told Dapaan. Faesal had sought to strengthen his new career through crowdfunding and urged people for donations. However, the donations in shape of worn out underwear and socks at his residence has caused a worry in his family. 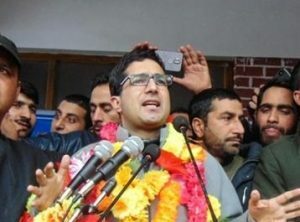 Faesal’s well wishers however say he was getting on platter the chance to grow from rags to riches. However, Faesal took to Facebook urging people to stop sending him donations of worn out underwear and socks. The stink of socks is making him think again about his political career. “The problem is, haven’t thought on yet, what to do after politics. Daktari chhod ke afsari ki, afsari chod ke politics, ab politics chhod ke kidhar jaaon (Quit profession of doctor for bureaucracy and then left it for politics, now where will I go after quitting politics,” reads Faesal’s new post.